Happy Horse Training Products include exclusive, high-quality educational tools, founded on our holistic vision of horse training, riding and care. The quality of our information is our inspiration. When you buy one of our educational products, we guarantee you will find comprehensive, intelligent and valuable material, the product of our own in-depth study and experience. The intention behind Happy Horse Training is not commercial. Our passion is promoting the well-being of horses, increasing the understanding of dressage as a pure, gymnastic art, and helping people to have a deeper relationship with horses. By purchasing our products you can help support us in these goals, at the same time as taking advantage of the insights they offer. Our eBooks provide everything you need to know to put into practice various different aspects of our holistic vision of horse care and training, which prioritises the well-being of the horse in all areas. They are well-written, comprehensive, and densely packed with information. Our eBooks are professionally edited to ensure clear and enjoyable reading. How Does an eBook Work? When you buy an HHT eBook, you will receive an email containing the link/s to download the PDF files. Simply click on the link/s to automatically download the eBook onto your computer, tablet, eBook reader or smartphone. PDF files are universal and work with any device, including most Kindle readers. If you prefer to read from paper, you can print out the eBook for your own use. We ask only that you respect our copyright and do not distribute our content, electronically or otherwise. A unique guide to training horses through energetic connection and gymnastic training. Part 1 covers everything on the ground, from handling to a method of lungeing that develops strength, straightness and engagement. Comprises over 60 000 words, with more 150 colour photographs. This eBook comes with a free supplement of over 11 000 words on Horse Trauma, giving a cutting-edge understanding of horse psychology. A truly original and comprehensive guide to practical rider biomechanics, revealing how to promote the remarkable phenomenon of postural engagement in the horse. 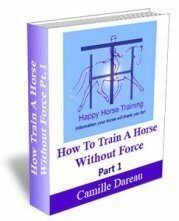 This eBook takes the rider through the process of developing their body in the specific way that brings the horse's movement into harmony and balance, without force and constraint. More than 55 000 words, and numerous colour photos and drawings by the author. "I am a Physiotherapist for humans and horses….. Over the last 6 years I have been seeking the connection you are speaking of […] I have met skilled horsepeople, however the descriptions of seat position is somehow eluding many of us.... I practiced the seat yesterday....WOW! 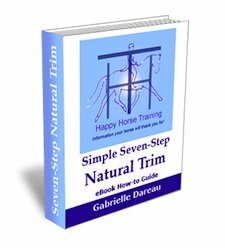 Thank you for taking the time to write this out completely and in way that is easy to turn it into practice"
This step-by-step guide shows you how to put into practice all of the benefits of the natural trim, inspired by the beautiful form and function of wild horse hoof. 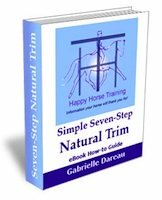 Detailed descriptions of every part of the trim, fully illustrated with clear photographs, will give you the confidence you need to get over the initial apprehension of learning to trim your horse's hooves. If you are already used to hoof trimming, the Seven-Step trim will refine your technique to ensure that it accords with the natural healthy hoof form. "Lovely: clear, concise and easy to follow"
HHT audio tapes are unique learning tools, which allow you to apply intelligent and effective techniques by listening to clear instructions as you work with your horse. Like our eBooks, these are digital products which you can download online and start using immediately. Our audio products are sold as albums of mp3 files, comprising courses of exercises to take you through applying our different techniques in practice. They are the ideal accompaniment to our eBooks, helping you to put the ideas into practice with real-time assistance in your ear. The first of our audio products to become available is AudioRide - an accompaniment to The Gymnastic Rider ebook. Watch this space for more audio courses. A riding instructor in your pocket! All you need is an mp3 player and a pair or earphones, and you have a riding instructor at the push of a button - and not just any instructor! You can now receive HHT's unique understanding of rider biomechanics, based on years of study of gymnastic riding, directly as you ride - the next best thing to having us teach you in person! 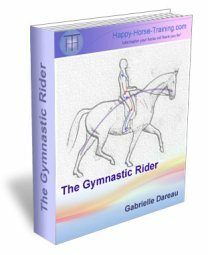 The AudioRide course is designed to accompany The Gymnastic Rider eBook, and is composed of three albums on the same three fundamentals of the rider's influence: The Seat, The Leg and The Contact. You can buy these 3 albums separately, or together at a reduced price. For full details of the exercises contained in each album, click on the link below for more information. You can also get the introductory exercise to the AudioRide course 'Riding In The Now' for free.